Mechanical room in a large office building. 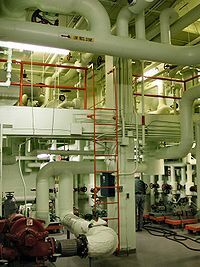 A mechanical room or a boiler room is a room or space in a building dedicated to the mechanical equipment and its associated electrical equipment, as opposed to rooms intended for human occupancy or storage. Unless a building is served by a centralized heating plant, the size of the mechanical room is usually proportional to the size of the building. A small building or home may have at most a utility room but in large buildings mechanical rooms can be of considerable size, often requiring multiple rooms throughout the building, or even occupying one or more complete floors (see: mechanical floor). Equipment in mechanical rooms is often operated and maintained by a stationary engineer or a maintenance technician. Modern buildings use control systems to manage HVAC cycles, lighting, communications, and life safety equipment. Often, the control system hardware is located in the mechanical room and monitored or accessed remotely. Rooms with only electrical or electronic equipment are not considered mechanical rooms but are instead called electrical rooms. Wikimedia Commons has media related to Mechanical rooms.